17 x 22 Special Edition Autographed Lithograph limited to 45 numbered prints. 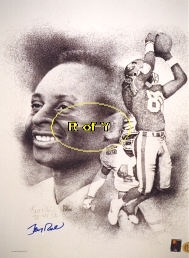 Signed in pencil by Artist Bill Dotson and blue sharpie by Jerry Rice. 2010 Football Hall of Fame Inductee.